In his book "The Lure Of Fantasy Islam : Exposing The Myths And The Myth Makers" Dr. Stephen M. Kirby unmasks self proclaimed "moderate Muslims" as false messiahs proclaiming and propagating their own religion and the non Muslims who ally with them. These "moderate Muslims" are viewed as heretics by their coreligionists and rely on support from non Muslims to sustain their myth making. 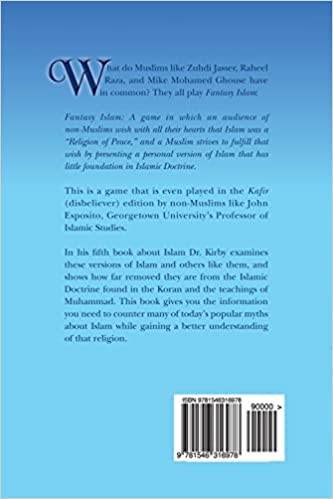 Fantasy Islam is defined by Dr. Kirby as "A game in which an audience of non Muslims wish with all their hearts that Islam is "A Religion of Peace" and a Muslim strives to fulfill that wish by presenting a personal version of Islam which has little to do with Islamic Doctrine." Dr. Kirby investigates and exposes the doctrinal flaws in the "moderate Muslims'" explanations of Islamic teachings and refutes them with citations from the Koran itself. 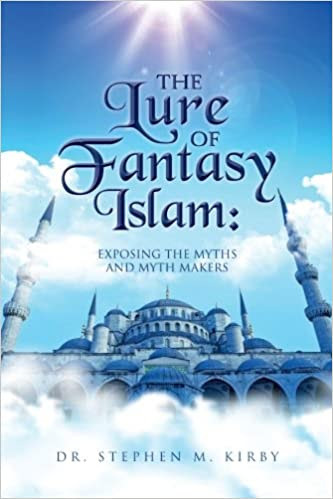 Both Muslims and non Muslims are players of Fantasy Islam and Dr. Kirby devotes a section of his book to Professor John Esposito, a non Muslim who propagates a "Fairy Tale Version" of Islam. He feeds non Muslims a pabulum of lies in order to convince them that Islam is a "Religion of Peace" by misquoting Koranic verses and leaving out any which interfere with this myth. The book explains how dangerous this disingenuousness is given the fact that Esposito is considered an "expert on Islam" and has been a consultant to the U. S. State Department when in reality he is an apologist for Islamism. Self proclaimed "Muslim Reformers" also play a dangerous and deceptive game of "Fantasy Islam". Dr. Kirby explains in a section entitled "Why Americanized Muslim Reformers Are Failing" that it is because "Islam prohibits what these reformers are trying to do". In other words,"moderates" like Zuhdi Jasser, Raheel Raza and Elham Manea who are members of the Advisory Board of the Clarion Project are propagating "their own personal version of Islam designed for non Muslim consumption". Mohamed Zuhdi Jasser has been referred to as "The Grand Mufti of the Stealth Jihad" and has labeled his critics, Dr Kirby among them, as "Alt-Jhadists". Dr. Kirby points out that these self styled "reformers" efforts are doomed to failure because they owe their support to non Muslims and have no influence in the Muslim community and concludes that it "is only the attention of the non Muslim world that will sustain the Muslim Reform Movement". Fantasy Islam has also made inroads in Israel and penetrated the Knesset due to the efforts of religious Jews like Rebecca and Ben Abrahamson who have bought into the myth of "moderate Islam" and the fantasy that peace can be achieved in spite of violent Koranic teachings. They are promoting phony "moderates" like Omer Salem, Javed Ahmed Ghamidi and Adnan Oktar aka Harun Yahya, both in word and deed. Dr. Kirby exposes the discrepancies between Salem's, Ghamidi's and Yahya's feel good interpretations about what the Koran says about peace and relations with non Muslims with the reality of what is written in the Koranic verses themselves. Dr. Kirby also explores the role of Islamist organizations in disseminating Fantasy Islam. He shows how ISNA (The Islamic Society of North America) purports to "condemn acts of terrorism" yet were themselves cited as unindicted co conspirators in the Holy Land Foundation Hamas funding trial. This invaluable book also exposes the dangers of interfaith activities, their non Muslim funders and how they are exploited by Muslims to recruit converts and lull non Muslims into a false sense of complacency by presenting Islam as a "Religion of Peace". "The Lure of Fantasy Islam" provides the intellectual arsenal to refute the Muslim and non Muslim "Myths and Myth Makers" and should be required reading for anyone who wants to further their understanding of what "The Religion Of Peace" is really about.